There is a difference between surviving and thriving. Survival is human. It’s what we do. It’s what Michele has been doing for 20+ years. Everything has always worked out “ok” and now she wants more. She would be okay to keep doing her money like she has been. She would be “ok” to allow her pattern of survival to keep playing out but she doesn’t want that anymore. The biggest reason is because the things she wants in life, really wants, she knows she can’t attract by doing what she is currently doing. Six weeks ago, Michele invested in one-on-one coaching and so much has changed. Michele had build an amazing life, but it was a little like building an amazing house on a not so solid foundation. The ground underneath her life was unstable. Because the foundation wasn’t strong enough to hold more, she wasn’t going to be able to attract more of the things she wanted until she stopped and fixed the foundation. It wasn’t as easy as simply realizing the foundation needed to be fixed. Michele hit rock bottom and made the choice to build the better foundation after making a decision about purchasing a car that turned out to be a financial blunder. In this interview she tells the story and how it was an expensive lesson but also one that has her committed to really growing into her Future Self. In the past six weeks Michele has been working on her Budget for Attraction and really getting clear about her numbers. This process has her welcoming in more fun and easy money, which she now has an amazing foundation for. Listen to hear all about how Michele is setting her life up for living even more awesome! You have probably been following Jeanne’s Year of Growth interviews over the last year. Listen in for more beingness in her life and see how she is continuing to grow. What Jeanne is celebrating right now? Learn how her Future Self shows up. See how a simple change in her office to represent her Future Self shifted things. Jeanne will talk about scripting and the amygdala. Learn what new things were attracted to Jeanne after the scripting workshop. Maggie had an experience many people have when it comes to growing. She came to the fork in road. One road, and choice, is to continue growing. And the other is to circle back to where you were and start over. It might sound silly to circle back and start over, but it happens to a lot of people on their growth journey and often they don’t even realize they are doing it. The cause is usually a fear of moving forward that they aren’t aware is there. It can look like signing up for a new program, buying a new book, or just convincing yourself that you need to take a break from coaching/growing. Those are all ways to circle back and start over, doing the same “growth” you did before. Often when you’ve already set the path to your future self in motion things happen to get you further on the path that you have no control over. Maggie had a situation come up that was less than pleasant to experience, but she can see now how moving through it made her more of her future self because she no longer has the fear her past self did. When it came up I definitely knew this was something she had to go through because her future self didn’t experience the fear around this particular situation. And the best to get over fear isn’t to go back and figure out why you’re afraid or how you’ve been afraid of this same thing before. It’s to keep moving forward. During this interview we talk about her journey and how scripting in a deep way prepared her to keep taking steps forward when this situation arose. We also talk about how making scripting deeper and more real pushed the fear in Maggie about moving forward because it went from fairy tale to real. Maggie is more committed to moving forward toward her future self than ever before. Listen to hear about how growing through fear is better than trying to fix it. Listen in as Cassie Parks reads you the first three chapters of her best-selling book, Manifest $10,000. Join Cassie to manifest $1000 in 10 Days in honor of her 5-Year Freedomversary of retiring from her corporate job. In this episode Cassie reads chapters 5, 6 and 7 of Change Your Money Story. In this episode Cassie reads chapters 1 and 2 of Change Your Money Story. You’ll be guided through how to identify your money story. You’ll hear about the thoughts, beliefs, and behaviors that each story causes. Jeanne makes a $20 investment in her Future Self every month, a pass to the car wash. She feels abundant when she can run through the car wash and not worry whether she has change or think about waiting until Tuesday (when she can save $1). The feeling she gets from having a clean car is one her Future Self has often. So, every time she gets her car washed she’s activating that feeling. Listen to hear more. You’ll also hear how Jeann has changed and evolved so much that she even experiences the unlimited car washes differently. It’s all part of how she’s stopped chasing and started living abundantly. You’ll also hear how she used to listen to Abraham for 2-½ hours while trail running and never quite figured out how to make the Law of Attraction work. My money story evolution Part 2. Click here to My Money Evolution Part 1. In this episode I discuss how I stopped chasing and started being someone who would someday be financially independent. I also talk about the inspired action that lead to creating my financial independence. Here are a few keys I share:. Recently, Sarah was offered and accepted a job that comes with a 30% increase in pay and will give her more time with her family. Not just any job either, a job that someone described as a “cheerleader for children” and that requires less nights and weekends than her current job. She shares her resources and is teaching her children to do the same. Being a money hoarder and having the title of her money story being The Struggle Is Real are distant memories for Sarah. Carrie-Ann is a fun person now. Fun finds her everywhere! Her life is easy and it flows. She finds joy in everything she does. It wasn’t always like this. Fourteen months ago, Carrie-Ann was living the money story of Survival. It impacted every part of her life. Even the limited joy she experienced followed the pattern of survival. If she did spend money on something she wanted to do she put tons of pressure on enjoying it and when it was over, there was a crash. To experience joy everyday was a foreign concept to Carrie-Ann. Starting with the 5 Day Change Your Money Story Challenge, Carrie-Ann’s mind opened to the fact that things could be different. She was inspired to want more and believe it might be possible to have more. So, she enrolled in Manifest $10K with support (now part of The Enchanted Circle). 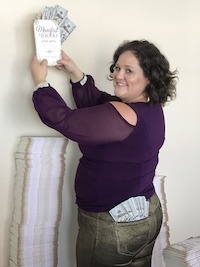 After completing her second round of Manifest $10K she continued her growth by taking the Script Your Millionaire Money Story workshop and has been scripting and stepping into her future self ever since. Carrie-Ann’s new money story is It’s Easy! Everything is easy, life is easy, fun is easy and money is easy. It all flows and Carrie-Ann is enjoying every minute of it. She’s out enjoying where she lives and doing things like taking ghost tours with her hubby and going to fund raising events, even signing up for stand up paddle board lessons. She’s happy every day and she’s excited for what is next. The path to happiness wasn’t paved with sunshine and roses. For Carrie-Ann it required cutting up an Ikea catalog (listen to hear about this pivotal moment), breaking down and learning how to feel. This was the hard stuff that true lasting growth is made of. It’s what moved Carrie-Ann out of who she was, living the story of Survival, to living the story now, It’s Easy! Carrie-Ann says what she’s learned and who she has become is engrained in her. She doesn’t have to think about it. Rather she acts and supports herself the way she has learned, the way her Future Self does. She is living a life today that fourteen months ago she couldn’t even see as a possibility. Listen to this episode to hear all about Carrie-Ann’s growth journey from Survival to It’s Easy! Today Jeanne won a crown, like a real crown. This win isn’t just about the crown it symbolizes so much of who Jeanne is, what she believes and the way she empowers her clients. Jeanne is the Menopause Guru. She believes that menopause is women’s crowning. It’s when they get to become the empress and Jeanne helps them claim that position. Today is awesome and last interview Jeanne was awesome, but she hasn’t been awesome for the last couple of weeks. Whether she was going through the break-down that sometimes happens when you jump into your Future Self or it was the last of her old self oozing out of her or her Future Self stepped out for awhile so she could remember who she used to be (2 and ½ years ago) so she could decide consciously she’s not going back to being her, doesn’t much matter. She knows the law of attraction works for her, even when she doesn’t feel amazing. The first time Jeanne and I talked about her working with me, she told me that she’s the person who broke the Law of Attraction. She was convinced it simply did not work for her. She thought she was focusing on what she wanted. She had pages of affirmations and she’d done her ideal client so she could call them in. But nothing felt like it was working. To be fair it was working based on her underlying thoughts that she didn’t think it worked for her. Now, Jeanne is someone who is always attracting amazing things, even when things don’t feel amazing. The biggest difference...Jeanne has become the person who she believes the Law of Attraction works for. She believes she’s always attracting good stuff and she is always taken care of. She’s also learned not to judge herself in any part of the process. Listen to the interview to hear how Jeanne got through the last couple of weeks that didn’t feel so good, and were so important to her growth journey. What’s awesome for Jeanne is that thirty-six hours before this interview she attended the best cocktail party ever. It was so amazing her cheeks hurt from smiling so much. In her last interview Jeanne told you how she made the decision to fly in and out of Denver for celebration cocktails. In this interview you get to hear all about the experience, the lessons and the awesomeness that is unfolding from this giant leap Jeanne took into her Future Self. In this interview she also talks about her “red shoe” lesson which comes from Cassie’s novella, Own It https://www.amazon.com/dp/B07CN9QCQV . Listen to hear all the juicy details from the best cocktail party ever! Trust is key when using the Law of Attraction. It’s doesn’t come easy though. It takes practice and growth to truly trust you get what you desire. Here’s what’s happening in Jeanne’s life because she has learned to trust on a very deep level. Today Jeanne talked to a client, had an impromptu mani-pedi and after this interview she is headed to pick up a dress to wear tomorrow night at celebration cocktails. She’s flying into Denver tomorrow morning just for cocktails and is flying back out tomorrow night. In addition she has a new client in her six-month follow on program. This is her highest revenue month ever. It definitely wasn’t always like this for Jeanne. She spent years frustrated and trying to figure out how to make her business work. She worried a lot and tried to control everything. She was in survival mode. Now that she has graduated to Thrivaval mode everything is different, better and the things that are a big deal aren’t catastrophes, they’re things like flying to Denver for cocktails. When you make the shift from surviving to thriving you experience the opposite side of the coin. Big huge deals when you’re in survival mode are things that aren’t working, things you might throw fits about. And when your thrivival mode, big huge deals are the amazing experiences you allow yourself to have. Both have a very big energy. Both have the power to create an abundance of the same. Both will invoke feelings. It’s just a matter of what experience you allow yourself to create. Jeanne has come so far in so many areas. In this interview you’ll hear about all of the above as well has how her husband recently went on a trip that could have derailed Jeanne’s plans for Denver, and she didn’t even allow that possibility into her field. Held her own story as true. Didn’t try and change her husband’s story. Listen to hear all the juicy details! At the time of this interview Jeanne has worked with Cassie for two years and three months. They have been working together in weekly one-on-one sessions for six months. Jeanne has been working with me for 18 months. Jeanne, The Menopause Guru, hasn’t really worked in a week for various reasons and yet she has four new strategy sessions to talk to potential clients. These aren’t the type of strategy sessions she had a year ago either, where people weren’t ready to invest the time, money or energy in themselves. These are quality, will likely turn into great client strategy session. If you’ve been listening to Jeanne’s Year of Growth interviews you know it wasn’t always like this for her. She struggled with imposter syndrome and having the confidence to believe she could help her clients the way she wanted. She also struggled with believing she could be a good business owner. All those things are in the past for Jeanne and her business has its’ own momentum that is building. Jeanne has really shifted into the “beingness” of The Menopause Guru. She owns it and people are seeking her out in ways that they haven’t before. She’s also getting more referrals than ever before. One of the major shifts Jeanne describes in this interview is going from “Can I sell you something” to “This is what I do.” She’s left the thousands of elevator speech formulas behind and is now connecting with each unique individual she meets. She has more clients than ever before. Connecting with the new version of her Future Self in the Script Your Millionaire Money Story Workshop a few weeks ago was key to opening up even more of this space and flow in her business and life. Listen in to hear all the amazing things happening easily in Jeanne’s life and business. If you ever wanted to ask Cassie what makes her LOA Coaching different, listen in. How do people find you and how do you work with them? What do you solve for your clients? How do you help people who can’t seem to make the Law of Attraction work? How do you work with people's setbacks? What is this future self you always talk about? How is future self different than affirmations or a LOA checklist? How does someone determine if they are ready to schedule an appointment with you?